Looking for ways to get involved in the new year? We need big community turnout at these action events throughout the month of January. 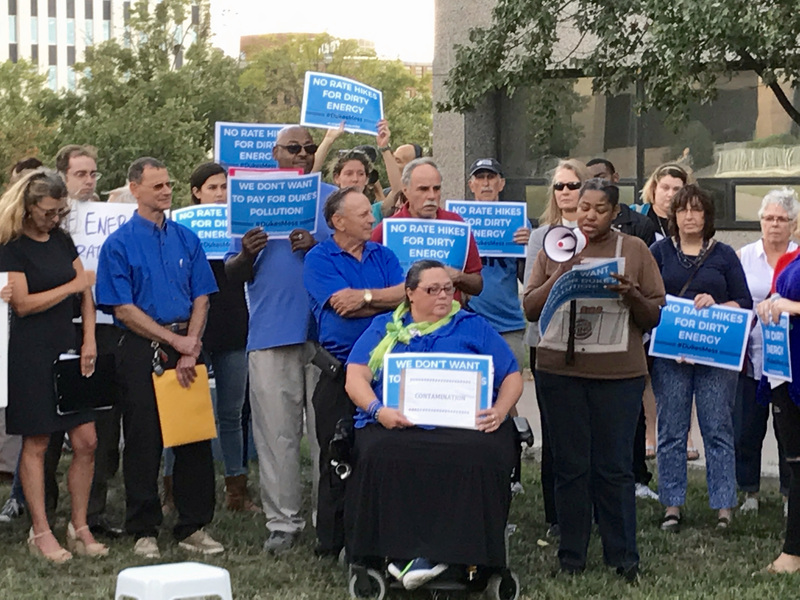 Join us to tell North Carolina officials to hold Duke Energy accountable and to protect our water! Raleigh: Thurs., Jan. 11, 11 a.m.
Charlotte: Thur., Jan. 11, 4 p.m.
On Thursday, Jan. 11, families from across N.C. will join together to share their stories. Duke Energy’s coal ash mess has poisoned drinking water and left hundreds of N.C. families with no alternative but to live on bottled water. Jan. 11 makes 1,000 days of cooking, cleaning and even brushing children’s teeth with bottles and bottles of water. We will hold a press conference in Raleigh at the General Assembly Press Room and a rally outside of Duke’s Charlotte headquarters to call for tougher groundwater standards for cancer-causing chemicals that many coal ash neighbors find in their drinking water and to demand full excavation of Duke Energy’s coal ash that is poisoning families. Join the Thunderclap to help spread the word! Franklin: Tues., Jan. 16, 7 p.m.
Greensboro: Wed., Jan. 24, 7 p.m.
Charlotte: Tues., Jan. 30, 6:30 p.m. The North Carolina Utilities Commission is holding public hearings on Duke Energy Carolinas’ proposal to hike customers’ rates by nearly 17% to pay for cleaning up the toxic coal ash pits Duke has neglected for decades. Most of this increase will occur in the flat service fee per month just to connect to the grid. This will place the heaviest burden on families with low or fixed incomes and threatens future savings by lowering incentives to invest in solar and energy efficiency. We’ve already been paying the cost for Duke’s mess: toxic pollution in our waterways and drinking water, threatening our communities’ health and well-being for years. It’s time for Duke to be held responsible for its mistakes. Please join us and show support for these families and thousands of others who are threatened with toxic water right here in North Carolina.